Thursday May 2nd 1895 I kept busy with the work all forenoon. The boys did not go to the field but did some work about the place. They picked our apples and cleaned the cellar some for me and took out the dining room stove. Will went to town in the afternoon. I worked with the hens that were sitting in barrels to put in new dry nests for them. Oliver helped me fix a dry nest for the turkey hen. Will brought papers so we could read all evening. Friday May 3th 1895 I had extra work to do in the cellar this morning and was looking after some more hens that are hatching. The boys are both plpwing. In the afternoon I did sweeping and cleaned up the kitched nicely. I then picked up the bricks in the east yard and raked it. of weather fine. 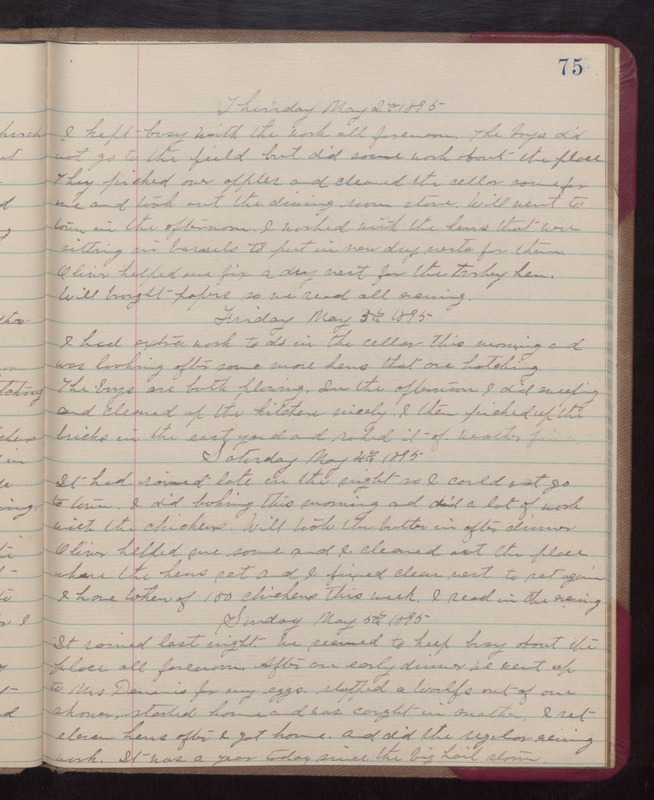 Saturday May 4th 1895 It has rained late in the night so I could not go to town. I did baking this morning and did a lot of work with the chickens. Will took the butter in after dinner. Oliver helped me some and I cleaned out the place where the hens set and I fixed clean nest to set again. I have taken of 150 chickens this week. Sunday May 5th 1895 It rained last night. We semed to keep busy about the place all forenoon. After an early dinner we went up to Mrs Dennis for my eggs. Stopped a Woolfs out of one shower, started home and was caught in another. I set eleven hens after I got home and did the regular evening work. It was a year today since the big hail storm.